Hi, Good Morning. Thank you friends and viewers. 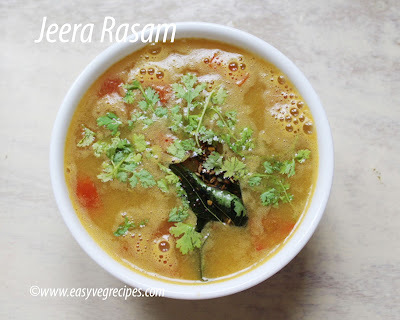 Today I will post how to make jeera rasam recipe. Rasam is a thin, very spicy South Indian soup made with tamarind juice and other spices as seasonings. It is normally served with other dishes. Not even a single day goes without having rasam at my place. It can be served with rice or can taken as a soup before meals. We have different varities of rasams, like garlic rasam, blackpepper rasam, plain rasam, tomato rasam and inguva chaaru(rasam with asafoetida). These are very few names I have mentioned but there are so many varieties of rasams. Jeera rasam or cumin seeds rasam is another variety. I got the recipe from a vernacular new paper. For a quick and easy reference I am posting a small video of the recipe also. Jeera Rasam -- Rasam made with cumin seeds and red lentils. Soak piggeon peas, cumin seeds and red chillies for half an hour. Soak tamarind and squeeze the juice and keep it aside. In a blender jar blend the soaked items along with curry leaves. Blend them to a smooth fine pasete. In a pan add tamarind juice, chopped tomato, salt and turmeric powder. Bring this to boil and add the above blended paste to it. Allow this to boil for five minutes. Heat oil in another pan, add mustard seeds, cumin seeds, fenugreek seeds, curry leaves and coriander leaves to it. Allow them to splutter. Add this tempering to the rasam. Serve Jeera Rasam with hot piping rice.